The subject of antibiotic resistance comes up frequently in the news media. Now considered one of the world’s most pressing public health issues, antibiotic resistance is sadly becoming an everyday reality for communities near and far. Antibiotic resistance occurs when bacteria change in some way that reduces or eliminates the effectiveness of drugs, chemicals, or other agents designed to cure or prevent infections. The bacteria survive and continue to multiply causing more harm. Antibiotic use promotes development of antibiotic-resistant bacteria. Every time a person takes antibiotics, sensitive bacteria are killed, but resistant germs may be left to grow and multiply. Repeated and improper uses of antibiotics are primary causes of the increase in drug-resistant bacteria. Here in the US, and especially in Oregon, many are quick to dismiss the threat of antibiotic resistance because of increased access to healthcare and better sanitation. While it’s true that most people in Oregon are not at great risk for Methicillin-resistant Staphylococcus aureus (MRSA) orCarbapenem-resistant enterobacteriaceae (CRE), this doesn’t mean that antibiotic resistance doesn’t affect us or put us at risk. There is a sweeping misconception that antibiotic resistance is an individual issue and that if one person is resistant that the resistance stays within that person’s body and affects only them. This couldn’t be farther from the truth. Antibiotic resistance is not just a problem for the person with the infection. There are resistant bacteria that have the potential to spread to others, thus spreading antibiotic‐resistant infections throughout the community. The startling reality is that every time a person takes antibiotics, whether it’s for the right reason or the wrong reason, sensitive bacteria are killed, and resistant germs may be left to grow and multiply. Repeated and improper use of antibiotics is the primary cause of the increase in drug-resistant bacteria and most of us contribute to the problem. Antibiotic resistance causes some of the most costly and significant danger for people who have basic, common infections that once were easily treatable with antibiotics. When it takes multiple courses of antibiotics to kill an infection or at worst, they fail to work; the consequences are longer-lasting illnesses, more doctor visits or extended hospital stays, and the need for more expensive and toxic medications. In the past, when common antibiotics started to show waning effectiveness or growing resistance scientists stepped in and developed newer and stronger antibiotics. Yet, during last decade, the number of bacteria resistant to antibiotics has increased dramatically. Many of these resistant bacteria affect us commonly throughout the year. 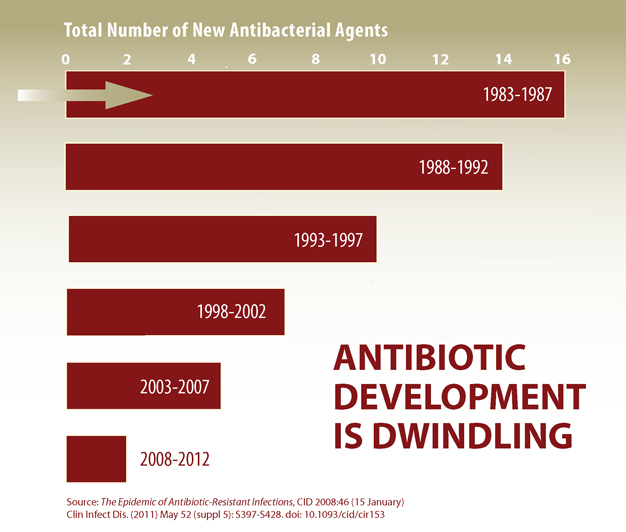 The cost and time to develop new antibiotics has become too great a burden and development has almost all but stopped. Yet, even if or when new antibiotics are developed, bacteria will evolve and find ways of resisting them. This is why awareness and action is needed to prevent new resistance and the resistance that already exists from spreading. According to the CDC, improperly prescribed antibiotics cost us and our health system $1.1 billion every year in unnecessary adult upper respiratory infection antibiotic prescriptions. It is estimated that more than 50% of antibiotics are unnecessarily prescribed in office settings for viral upper respiratory infections (URIs) like cough and cold illness. In hospitals, up to 50% of antibiotic use is either unnecessary or inappropriate. It’s important for healthcare providers to stay up to date on best practices and utilize strategies to delay or eliminate the use of antibiotics for viral or inappropriate infections. We as patients and individuals make a difference. One study showed that doctors prescribe antibiotics 62% of the time if they perceive parents expect them and 7% of the time if they feel parents do not expect them. There is a common belief that antibiotics work for every illness, but they don’t. Antibiotics are lifesaving drugs that can and do cure bacterial infections. Treating viruses with antibiotics does not work, and it increases the likelihood that you will become ill with an antibiotic-resistant bacterial infection. Practice good hand washing, cover your cough, and get plenty of rest and good nutrition. A healthy body is the best prevention against any type of infection. Get your recommended vaccines and your flu shot every year. Antibiotics may not help against viruses but vaccines do! If you have a cold, flu, or other viral illness don’t ask for antibiotics. Instead, stay home from work or school, get plenty of rest, drink lots of fluids, avoid cigarette smoke, and remember that it takes time to get better, often 10 to 14 days. If you are given antibiotics take them exactly as the doctor prescribes. Do not skip doses. Complete the prescribed course of treatment, even when you start feeling better. Just because you feel better does not mean that all of the infection causing bacteria are gone. Do not save antibiotics for the next illness. Discard any leftover medication once the prescribed course of treatment is completed. Only take antibiotics prescribed for you; do not share or use leftover antibiotics. Antibiotics treat specific types of infections. Taking the wrong medicine may cause serious complications, delay correct treatment and allow bacteria to multiply. Do not ask or pressure your provider for antibiotics. Antibiotics are serious medications that have side effects. When your doctor says you don’t need an antibiotic, taking one may do more harm than good. If you want to learn more about antibiotic resistance, get free educational materials for your organization or clinic, or take advantage of our free CME/CE for healthcare providers then visit the Oregon Alliance Working for Antibiotic Resistance Education’s (AWARE) website at www.healthoregon.org/antibiotics. National Center for Immunization and Respiratory Diseases, Division of Bacterial Diseases. “Get Smart: Know When Antibiotics Work.” Centers for Disease Control and Prevention. Centers for Disease Control and Prevention, 21 Jan. 2011. Web. 01 Apr. 2014. Mangione-Smith R, McGlynn EA, Elliott MN, et al: The relationship between perceived parental expectations and pediatrician antimicrobial prescribing behavior. Pediatrics103:711-718, 1999. Scott JG, Cohen D, DiCicco-Bloom B, Orzano AJ, et al: Antibiotic use in acute respiratory infections and the ways patients pressure physicians for a prescription. J Fam Pract: 50(10): 853-8, 2001. Fendrick AM, Monto AS, Nightengale B, Sarnes M: The economic burden of non-influenza related viral respiratory tract infection in the United States. Arch Int Med: 163(4): 487-94, 2003. Got a Cold or the Flu? Antibiotics won’t work for you! Colds and the flu are hitting the northwest particularly hard this year. We are all seemingly surrounded by a cacophony of sniffling, sneezing, and yes, even some snorting. Individuals are eager to have everyone feel better and calm restored to immune systems everywhere. Out of all remedies that people try there is one often requested remedy not only that won’t help anyone feel better faster, but could also put you at risk of a more serious illness later: antibiotics. It’s true that antibiotics are miracle drugs, capable of battling once fatal or crippling bacterial infections. Yet, antibiotics are only good for just that: bacterial infections. 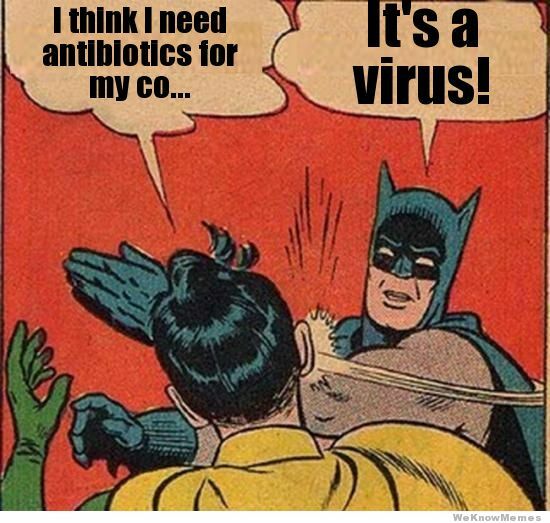 Antibiotics do not work for viral infections and colds and the flu are both caused by viruses. Yet, providers continue to prescribe antibiotics for these infections and patients continue to ask for them even though they will have little to no effect on their symptoms. In fact, flu researchers in Boston found that from 1995 through 2002, a 26 percent of patients who were diagnosed with flu were prescribed antibiotics (Linder et al. 2005). This excluded people whose diagnosis could include a bacterial infection, such as pneumonia, the only plausible reason to prescribe antibiotics when they have the flu. While these numbers may not seem huge by themselves, if you do the math there are anywhere from 2 to 4 million people who visit doctors’ offices for flu every year. That means when you add these together that there are 500,000 to 1 million antibiotic prescriptions every year with no possible benefit to patients. This many unnecessary antibiotic prescriptions for cold or flu patients each year puts a strain on our already weakened antibiotic efficacy. Each time an antibiotic is used improperly there is a risk of killing important “commensal” or healthy bacteria. This leaves the body open to resistant bacterial strains multiplying if/when bacterial infections, like pneumonia, actually do strike. There are ways to combat antibiotics overuse, starting with individuals. No one enjoys being sick and our schedules don’t allow us a lot of time to recover, but the best ways to prevent and lessen the duration of colds and the flu start at home. How do I stop a cold or the flu from starting? Wash your hands! Remember to wash for 20 seconds and dry hands thoroughly. Get your flu vaccination every year. Avoid close contact with others with colds and the flu. How can I treat my cold or the flu? Every time antibiotics are used incorrectly it puts all at risk of developing a resistant infection and diminishes antibiotic effectiveness in the future. We all have a role to play in preserving our antibiotic resources. Patients, healthcare providers, hospital administrators, industry, policy makers and the general public can work together to promote appropriate antibiotic use – ultimately saving lives. So this cold and flu season, think twice before asking for or prescribing antibiotics, so we can all feel better today, tomorrow, and in the future. 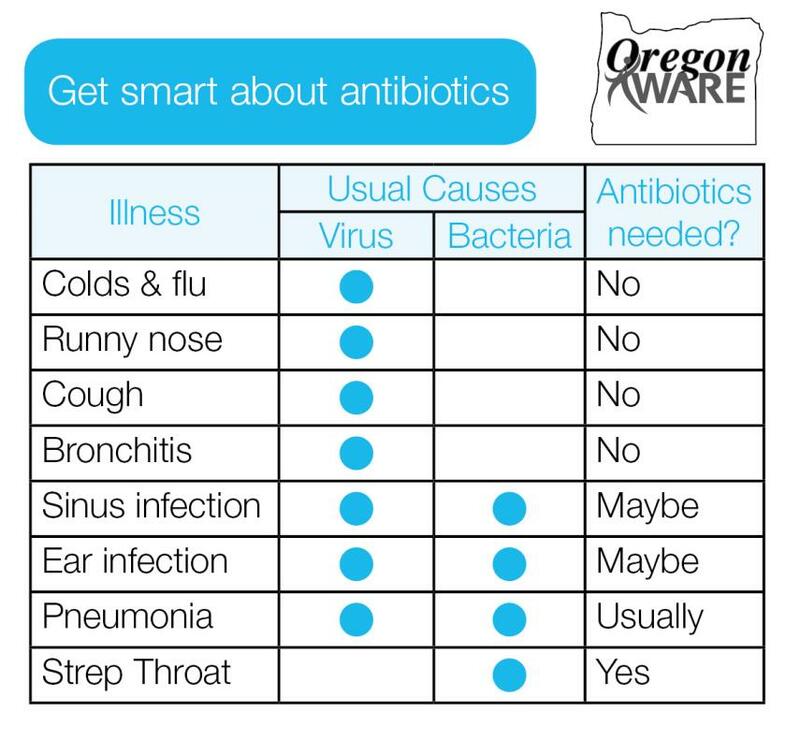 For more information on antibiotic resistance or cold and flu prevention visit: www.healthoregon.org/antibiotics or flu.oregon.gov. Gelband, Helen. “http://www.rwjf.org/content/dam/farm/reports/issue_briefs/2009/rwjf64483.&#8221;Robert Wood Johnson Foundation. Extending The Cure, 01 Oct 2009. Web. 18 Feb 2014. Comments Off on Got a Cold or the Flu? Antibiotics won’t work for you! Enter your email address to subscribe to ImmiNews and receive notifications of new posts by email. Raising HPV Vaccination Rates: What Works? Click here to visit our Facebook site!